Assyrian warriors with large Stand Shield. Home » Assyrian warriors with large Stand Shield. 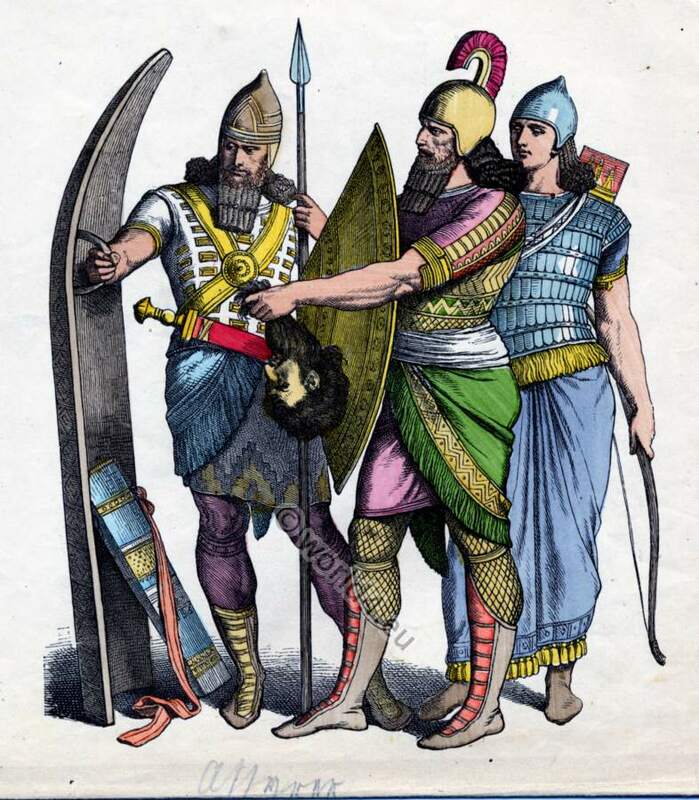 Ancient Assyrian warriors with large Stand Shield. Warrior with Hand Shield. Archer. The Assyrians were a nation in central and northern Mesopotamia (Iraq). They repeatedly exercised hegemony over northern Mesopotamia and northern Syria and conquered by the king Tiglath-Ninurta I (1233-1197 BC) even Babylon. The Assyrians were a very warlike nation on a high stand, the main cultural influences based on Sumerian culture, but also Hittites and Persia influenced their development. The Neo-Assyrian Empire (ca. 750-620 BC) is considered the first great empire in world history. The clothing consisted in the main of the tunic, and a scarf. The size, color and material of the clothes varied according to social status and consisted in the main of linen and wool. The decoration consisted of rich ornamentation. Jewelry, woven and embroidered pattern and fringe were used in great abundance. A wide belt, as he is seen on old drawings was probably reserved for men. The warriors of the Assyrians clothed with tunic and wide scarf, high leather boots and gaiters, on his head a helmet with plume. Hides and skins were used as decoration of armor. They were excellent fighters with the bow and arrow, lance (Ulmu) and shield and a sword of bronze, were armed. Iron coats of mail and swords were exchanged at a later period of the empire of the Hittites. The warriors of the army had been equipped by the state and by the end of their service time for them to return back to the state. Source: The history of costumes. Munich picture sheet. (Münchener Bilderbogen) Published and published by Braun and Schneider in Munich. Published between 1861 and 1880. Mesopotamia. Assyrian, Babylonian costume history. This entry was posted in Ancient, Asia, Assyria, Middle East, Military and tagged Ancient Assyrian clothing, Münchener Bilderbogen on 6/27/13 by world4.